Get ready to batten down the hatches, folks, for The Walking Dead star Melissa McBride has told fans to prepare for a “crazy ride” with season 6 ahead of its premiere in October. The actress – who is set to reprise her role as Carol for the hit apocalyptic series – sat down with Entertainment Weekly to talk about the show’s expanding scope, its new characters, and why the upcoming season will be the craziest one yet. Arriving on the heels of the outlet’s cover story, which also served up a bevy of screenshots (that can be seen above) for the upcoming batch of episodes, here’s what McBride had to share about what to expect when season 6 premieres. While it isn’t an awful lot to go on, it’s still a nice teaser for the events yet to unfold. Over the years, McBride’s Carol has become somewhat of a fan-favorite amongst fans, acting as a highlight of Rick Grimes’ ragtag crew of survivors. Of course, much like the trouble that brewed around Terminus from the previous season, The Walking Dead season 6 will focus on the internal conflict between the remaining characters. 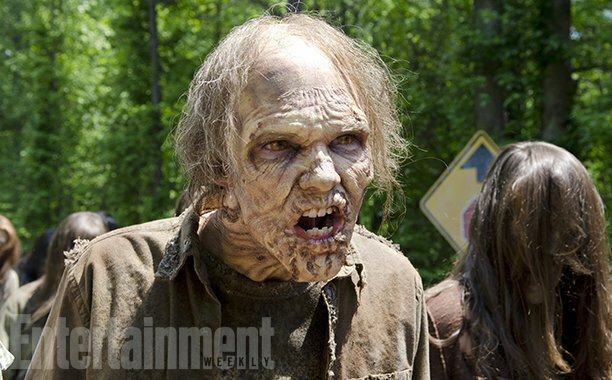 No longer is AMC’s series primarily concerned with the walker vs. human dynamic. Before The Walking Dead returns for season 6, though, AMC will kickstart its companion series, Fear the Walking Dead. Due to hit the small-screen later this month, the spinoff brings the apocalypse to the west coast as it charts the early days of the infection. Cliff Curtis and Gone Girl‘s Kim Dickens topline AMC’s companion piece. AMC will bring back its flagship zombie series when The Walking Dead season 6 premieres on Sunday, October 11th at 9 p.m.